Is there any fusion library available which uses all the three sensors to calculate the pitch, yaw and roll with improved accuracy? Coordinate system does NOT have right-hand orientation. You have to negate readings corresponding to one of the axis to make it right-hand oriented. Can you use this as a 3d horizon and compass with the microview? 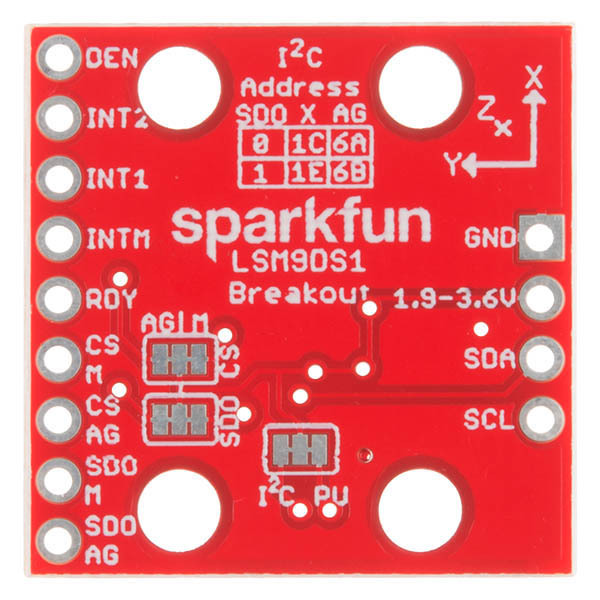 Has anybody managed to get a meaning full heading from one of these connected to a Arduino? The example sketch seems to work well but the Heading is miles out. Does this need calibrating? I recently purchased two of these sensors and I am looking to use them with LabView. I have been made aware that I need to break the solder connection on the back of the sensor in order to have a separate resister. Does any have ideas of exactly what needs to be done and how the resister changes. I don't have much experience with any of this. Check out the hookup guide, but it looks like you do not have to change resistors. Right now all of the jumpers have the middle pad connected to VDD and the other pads connected through a resistor making this effectively a pullup resistor circuit. In theory you can just pull them down, but you may want to cut the traces first. I'm guessing you just need to change the address of one of them. If you still have questions feel free to email our techsupport department and they should be able to walk you through it. just so I'm clear, this unit uses the 3 axis gyro to detect true up, vs "up" of the board/ic, correct? I'm looking for something that can identify when it's Z axis is pointed straight to the sky, vs the unit being considered "flat" in regards to initial calibration, nor it's speed in a direction (similar to gyroscope apps on the android market place) I suppose more of a rotation detection IC? 1) The LSB address select pins (SDO_A/G and SDO_M) does it matter if its configured as high or low or is this simply determining its I2C address which is used in software? What is the purpose of having this selectable? 2) I currently have the two previously mentioned pins connected to 3.3v (High) along with CS_A/G and CS_M connected to 3.3v to select I2C. Can I simply connect these pins straight to 3.3v, or do I need to put a pull-up resistor on each? Can I use my MCU's internal pull-up (20 kOhm) and not add any external ones? (This is for the LSM9DS1 by itself, but i'm modeling the PCB based on the sparkfun breakout board). Looking at the schematic we do have a pullup resistor on the SDO line as it should be tied to something. There is a jumper allowing the user to disconnect the pullup and set the pin to low if they'd like. The main advantage to this is if you want to use 2 of these on one I2C bus, in that case you can change the address of one of them. In theory if you get 2 different devices that have the same I2C address you can change one as well, but this is not common. As a general rule you should be able to connect a pin directly to VCC (instead of through a pullup) if there is no chance you will try to pull it down. What is the ADC resolution in this thing? 16-bit? Whenever I set the accelerometer range to 16 and calculate the magnitude of xyz it gives me ~0.67g at rest (which is obviously wrong) but when I switch the range to 8 and calculate the magnitude it gives me ~1g at rest which is correct...what's happening when I change the range to 16g? Is this IMU compatible with ComMotion Motor Driver Shield? I tried to connect the IMU with the motor shield and the redboard but the IMU and the motor shield don't work together. Both the IMU and the motor shield works well separately. I used the I2C wiring for the IMU. Edit: I was having issues with the module hanging. I think the root of my problem is that I'd copied some initialization code from the example "LSM9DS1_Settings.ino". One or more of the settings was causing glitchy behaviour. After reverting to the default settings in the library's init() function, the problems went away. Having a boatload of fun with this board. Thank you Sparkfun! Hi, I just have 1 question. 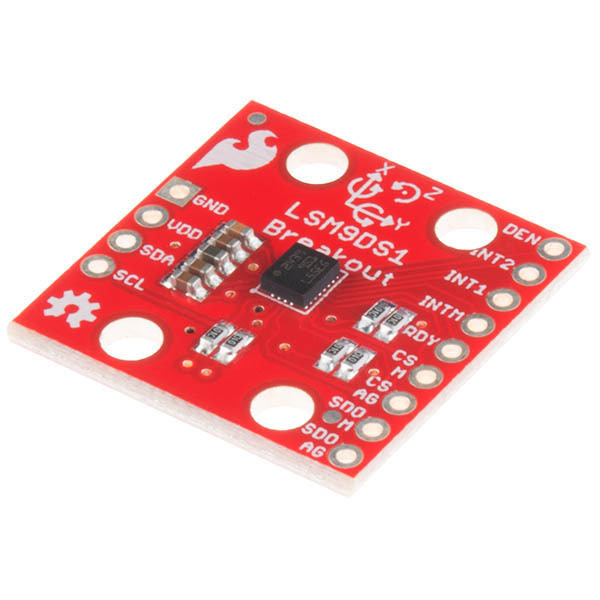 What are the differences between this IMU and the retired product LSM9DS0? The functional differences are pretty slight. There are a few variations in the selectable sensor ranges - the LSM9DS0 offers one extra selectable accelerometer range (Â±6g), and the magnetometer range options differ. The DS1 has lower power capabilities, and it costs a bit less :). Using the LSM9DS1_Settings example I get bad readings for the temperature. I've tried dividing by 16 and adding 25 (as indicated in the data sheet - if one reads very carefully) but this doesn't solve the problem. The raw values I get are decimal -768 or -1024. Any ideas? Is there something I'm missing or is the temperature sensor on the chip bad? and the magnetometer has full-scale ranges of Â± 2, 4, 12, or 16 gauss. Edit: Stupid markdown formatting, I have to press enter twice between 2 lines, otherwise they appear next to each other. Is there any difference with the LSM9DS0 besides size? The register and device mapping are quite a bit different, but on the surface they're really, really similar. The LSM9DS0 offers one extra selectable accelerometer range (Â±6g), and there are some differences in the magnetometer ranges. The DS1 has lower power capabilities though. Enter a reply...The coordinate system for the magnetometer is different between the two devices. 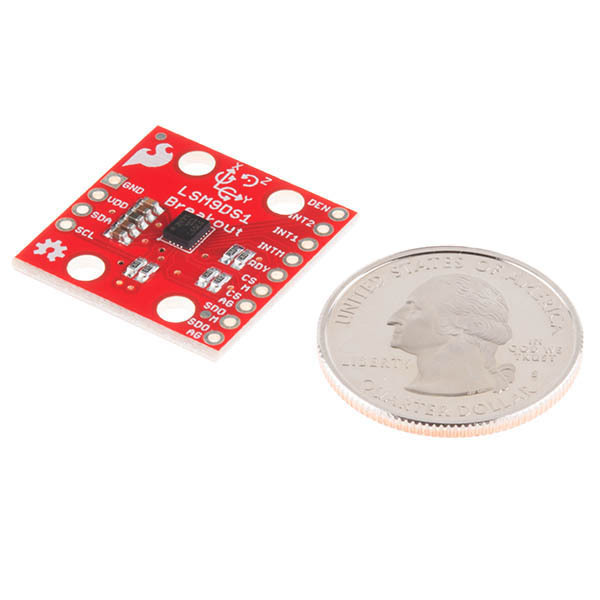 The gyro and accelerometer in the LSM9DS1 have a single FIFO buffer available that stores up to 32 16-bit gyro and acceleration data values in separate registers. 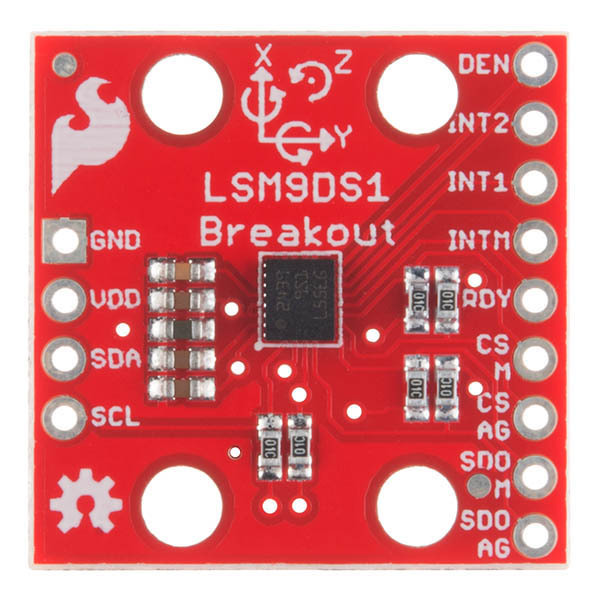 In the LSM9DS0 the gyro and accelerometer are located in separate sensor devices embedded within one package and have separate FIFO buffers. Practically speaking this means the code is a little different, but I'm not sure that you would notice a functional difference. For now I prefer the LSM9DS0 just because it makes it easier to debug or only use one of the sensors if you want to. The LSM9DS1 is a newer device. Is there an AHRS firmware for this board similar to the Razor IMU? Somehow I got started at the wrong end of the stick and wasted a week on this. Calibrating, reading, and making this useful without an unnecessary Arduino CPU in the picture turned frustrating. And there does not seem to be a lot of other code out there that suits my needs. This code, in spite of being in in a seemingly RasPi-exclusive source, builds great under Ubuntu desktop, other small arm platforms, includes both C++ and Python wrappers, and has both local and remote (serial) client tools for calibration. The code is clear enough, and there is a useful Calibration.pdf document included that is informative. As always, however, it could use a bit of other documentation. Other versions of this library are out there, but seem to have been abandoned for now. Native code for standard platforms makes sensors like this much more useful. Having used other 9 DOF IMUs, it is the available libraries that make this type of product useful, the library available for LSM9DS1 is good and examples are useful. The simple I2C setup worked with no issues for me. When i first hooked this thinger up I accidentally used the DS0 vs DS1 libraries and was pretty excited because of the AHRS stuff that came in the DS0 libraries. Unfortunately those don't work with the DS1 so i had to spend an hour or so porting over the AHRS example from the DS0 libraries. Since this is a 9DOF chip it seems to be there should be an AHRS example as that is really the primary reason behind getting a chip like this, and dealing with the math intensive AHRS algorithm can be a little daunting. Hard to set up two or more. The sensor works really well, but as I tried to set up together more than one, wasn't able to hook up by I2C, as the addresses can't be changed. Arduino library makes it really easy to use. While the price is perfect, the sensor did not perform as expected. Just sitting on a table indoors, the gyro and magnetometer were bouncing wildly (~20 dps and ~3 gauss). The accelerometer was fairly stable but the point of the IMU over the accelerometer is to collect data from the other components. We bought two boards and both had this issue so we decided against using them. Wasted our money and time. If you have no need for accurate measurements, this might be fine. This is a lot of action on a tiny board and, paired with my Arduino UNO, the project possibilities are nearly endless! I haven't tried the SPI hookup yet but the I2C is dead simple and works great. Documentation was easy to access, very complete and easy to understand. Cool is the best word! the library and example code is pretty easy to understand and use. The i2c interface is sweet and simple. I need to figure out a few things like max update rate and such. I might update as I go.